Discussion in 'The Beat of The Brass: Herb Alpert/Tijuana Brass' started by Captaindave, Jul 18, 2018. I saw something about Music Volume #3, scheduled for release on October 19. 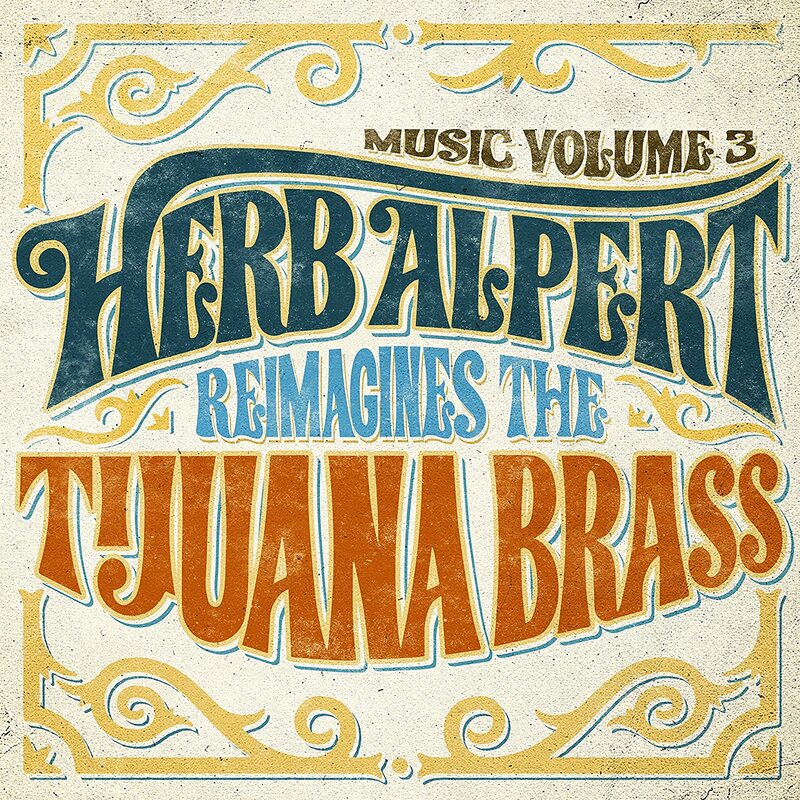 It's called "Music Volume 3 - Herb Alpert Reimagines the Tijuana Brass". Updated versions of Tijuana Brass songs. There's a preview of Wade in the Water on Soundcloud.com. It was released on July 15. I like what I hear. This will be a great one if all of it is like the preview. I cannot wait to hear this Music Volume 3 ! toeknee4bz and LPJim like this. Well, after hearing the preview of Wade in the Water, I am very much looking forward to hearing more of this. Could be the best thing I've heard in a long time. Although I wasn't a huge fan of Music Vol. 1, I really really liked A Christmas Wish, and loving the inside-joke-type humor of the new title, and considering it's going to be all TJB songs....I have high hopes for this one. I am and have always been a huge 1960s TJB fan....I am ready to hear an album of some of those songs again with the old style Herb Alpert arranging genius and sound applied. I very much like what I hear on the soundcloud clip of Wade in the Water. Looking forward to what "reimagining" the Tijuana Brass brings forth. In the dialog between Mr. A and the interviewer on the liner notes to the "Mariachi Brass with Chet Baker - "Hat's Off" album from 1965: Mr. A said: "I'm going to put jazz into the Brass.".... "When?" "Eventually". Just so long as Freight Train Joe isn't one of tunes. Listened to the Soundcloud snippet. Certainly is inviting. Always liked his version of "Wade In the Water". Everytime I see the Alvin Ailey routine with that song I think of his version. The snippet says the song is available but I've not seen it on iTunes or Amazon or his website (which the snippet said would have it). I liked Music Vol 1 (not necessarily the title though I get and appreciation the Traveling Wilburys reference/homage) ; some tunes more than others. This forthcoming "record" idea is an interesting concept. I've always liked the Bob Dylan approach of never doing the same thing the same way, but I suppose you cannot blame Mr Alpert for revisiting his successful catalog. Always liked his post TJB music more so. I have been listening in the past few days to some Paul Anka albums form the 70s - Listen to Your Heart, Music Man, notably - and Walk a Fine Line, and got to thinking that he should re-record these because they are some really good MOR tunes, and especially since Sony hasn't gotten around to re-releasing them digitally (though they've been doing a lot of work on re-releasing in digital a good part of back catalog of folks going back to 60s). Listen to Your heart was released on CD in Japan, though (which is how I obtained it last year). Don't believe that the U.S. a.m. time is correct - track did not play today at 8:01 a.m. The afternoon time appears correct - 2:52 Eastern Daylight Time. I've decided not to listen to any advance samples this time....gonna wait to hear the whole thing at once. toeknee4bz and Nathan Strum like this. Fully agreed. I prefer to listen to an entire album for the first time when it's released. Then I'm not taken out of the moment by hearing something I'm already familiar with. ??? Never could understand the disdain for this track. I've always loved it. Great earworm! I am very much looking forward to this. I hope one of my all time favorites Zorba the Greek is on this new disc. Excited to see what’s on Vol. 3. Agreed. I think we're all wondering just which TJB tunes Herb will cover this time! It's up for pre-order on Amazon.com. Nathan Strum, Bobberman and DeeInKY like this. I'm sure this will be a fine album and I hope Herb writes some liner notes explaining the picks. My only concern is, many of these tunes are the ones that have already been done to death. A man of my vintage has been enjoying them for half a century. Maybe the hope is some younger folks will get on board. What I'd really like to see is a reformation of the Baja Marimba Band, this time with young Latin players re-imagining that bands book. Some real strong tunes there with a large Hispanic market to tap into. Maybe the hope is some younger folks will get on board. What I'd really like to see is a reformation of the Baja Marimba Band, this time with young Latin players re-imagining that bands book. Some real strong tunes there with a large Hispanic market to tap into. Coming up with a single album that contains selections drawn from the first ten albums - Lonely Bull through Beat of the Brass - would be quite a challenge. There were so many good songs worthy of consideration. Including the biggest and best hits would seem almost necessary on a project like this. I do notice, however, that Tijuana Taxi isn't included. I love the cover art - that logo really channels the old TJB logos from some of the albums, especially Whipped Cream and South of the Border. It's not too surprising that Whipped Cream gets more tracks than any other album, given it's his most famous album. I'm a little surprised that the "early" songs are given so much of the play list -- although, maybe one could speculate that Herb was still 'finding his sound' on those first few albums (and we all know that he was dissatisfied with Volume 2) so this set maybe gives him a chance to re-think the arrangements, styles, etc. where on the later albums, with his "sound" intact, he might not think those songs need reimagining! This is, what, his fourth version of "Lonely Bull?" I'm really curious if Herb's current touring band is going to be involved in this, or if he's using a larger band this time. (As regular readers might know, I've decided not to listen to any samples on this album so I haven't checked out the Soundcloud sample.) Hopefully Randy will chime in with some info as time goes on. Despite the popularity of the song, I'm a little unclear on how Rise gets included on a re-imagined Tijuana Brass collection?